Are you scared of zombies? Well, you should not! 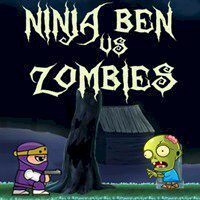 Cause in this game you must save the girls and kill all zombies here! Our little ninja is good equipped, so use bombs and helicopter to clean this forest from all these terrible creatures. We know that you can cope with it. Here is a young girl got lost deep inside the cursed forest where a great number of zombies continuously hunt for every living beings. And she is in a desperate need for help so our hero Ninja Ben ventures to save her. Could you believe that? This time the young ninja is equipped with a powerful gun and can also place bombs to stop the zombies on their way. Just a great feature of this game is the fact that ninja can use backup support from a helicopter that will shoot against zombies from the sky. If you are ready, then go!